Following a new trailer and a series of colorful character posters for The LEGO Movie comes another new poster, this one teasing Lego mayhem, as our heroes can be seen running in terror, while the the sinister Lord Business (Will Ferrell) hovers over a pile of fire behind them, a menacing expression on his face while fire shoots from his horns, which I’m pretty sure are made from LEGO coffee cups. Hey whatever works to connect your flames to your headpiece, right? 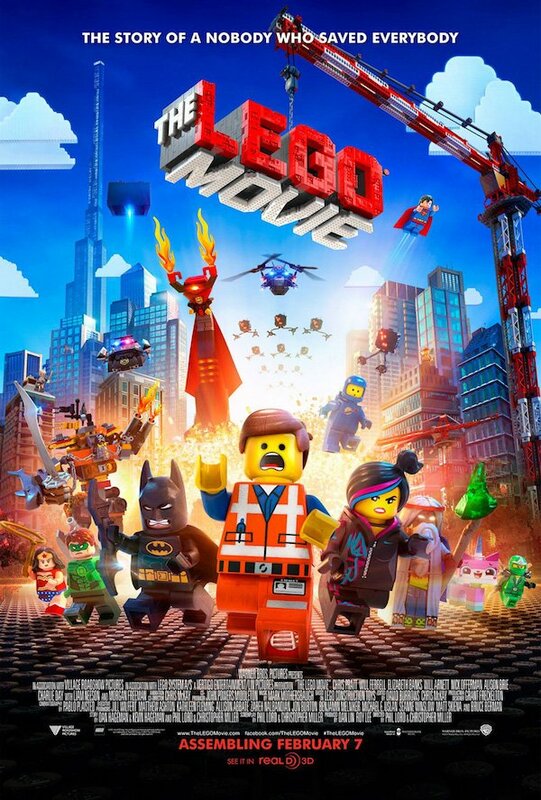 In front, we can see the hero of the story, Emmet (Chris Pratt), the LEGO mini-figure who’s mistakenly thought to be the extraordinary MasterBuilder who’s recruited to join a quest to stop Lord Business from gluing the universe together. The line-up along the bottom from left to right is Wonder Woman (Cobie Smulders), Green Lantern (Jonah Hill), Batman (Will Arnett), Emmet (Chris Pratt), Wyldstyle (Elizabeth Banks), Vitruvius (Morgan Freeman), Uni-Kitty (Alison Brie) and the Green Ninja, though I’m not sure who’s voicing him (or her). It’s very possible Green Ninja doesn’t speak, actually. Up above, we can see Spaceman Benny (Charlie Day) and Superman (Channing Tatum). It also looks like there are a couple of helicopters and other vehicles there, which I like to think took someone hours to assemble, using a set of fold-out instructions. 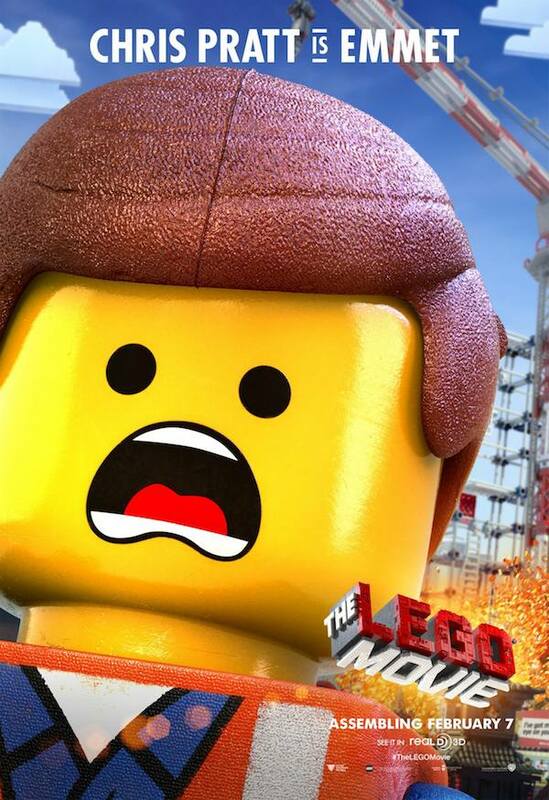 You can check out Emmet’s character poster below. Other previously released posters show us Batman, Benny, the 1980s space man you can see floating around in the above poster, and the wise Vitruvius, voiced by the great Morgan Freeman. 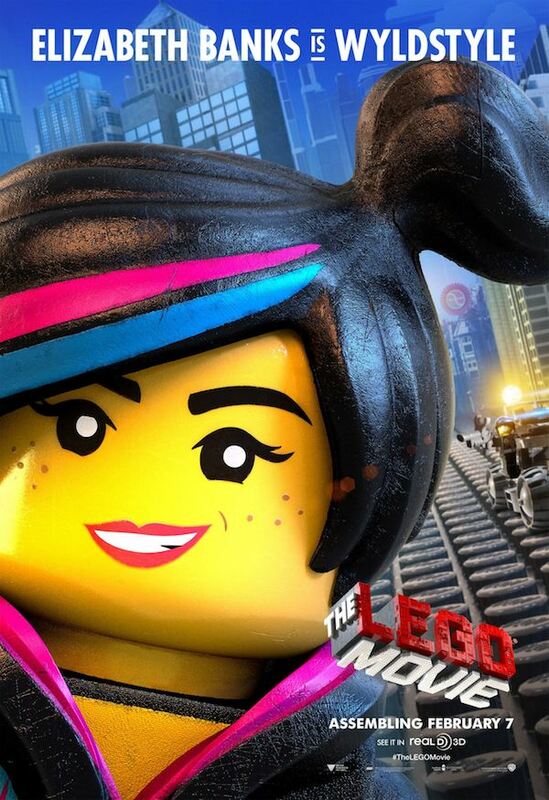 Directed by Phil Lord and Chris Miller, The LEGO Movie arrives in theaters February 7.